Sports Costs > How Much Do Golf Balls Cost? How Much Do Golf Balls Cost? If you’re an avid golfer, you probably already know how often you have to replace your balls. Between the lakes, endless woods and lost balls in the garage, this can seem like a never-ending expense. The cost of golf balls differs according to the brand, material, quantity, where you purchase them and durability. On average, depending on the brand that you like to use, the prices for a box of brand new golf balls are going to range anywhere from $15 to as much as $50 per dozen. The two main factors that will affect the cost of a golf ball will be the durability and the brand name. Knowing the ball is going to receive a lot of blows, durability a very important factor; therefore, it is not just the cost to consider but also how long the ball will last. Even though the ball you purchase is cheap, it will eventually cost you more since you have to replace it more often. Also, like most of the items you purchase in life, manufacturers, who have made a name for themselves with the long number of years of being in the business, naturally command a higher price. Range practice golf balls, on the other hand, can cost about $150 per 50 dozen or so. At Walmart, for example, most of the best sellers noted on the official retail for $19 to $40 per dozen. Refer to our table below to see what the most popular brands could cost you. Golf balls, when sold online at a local retailer, are usually sold per dozen in a box, but if you were to purchase practice golf balls, for example, then you may receive up to 10 to 20 dozen per order. Golf balls can be made in two parts or three parts. The two-part golf balls are the cheaper ones and are made of a rubber and plastic. These are the most common type of golf ball and makeup 70 percent of golf ball production. However, they are not the most accurate and reliable balls. The three-part golf ball is more expensive and is the one that is used by professionals. This type of ball is made of plastic, windings of a rubber thread, and a core that is made of either solid, gel, or liquid. Certain golf balls are manufactured for different purposes. For example, some are made for farther distance while others are made for a certain type of spin. Some players, especially those who already play professionally, prefer to have their names or initials printed on each ball. Known as personalized golf balls, this is considered to be an additional cost. Beginners usually will not be able to tell the difference between a cheap ball with an expensive ball, so the price of the golf balls will not really matter until after they gain experience and a feel for the ball. When buying online, it is best to read comments and feedback about the product before making a purchase especially if you are not familiar with the brand and type of the golf ball. Do not just purchase cheap golf balls because of their price. Online and local retailers often have sales such as “buy four dozen for the price of three.” Search for the best deals ahead of time to see what you can find. Some online stores even have a clearance section. If you are a newcomer to the sport, consider the fact that you will probably be losing a lot of balls while perfecting your craft, so cost is a big consideration. By buying in bulk, the price can significantly go down, especially if you purchase no-name golf balls. 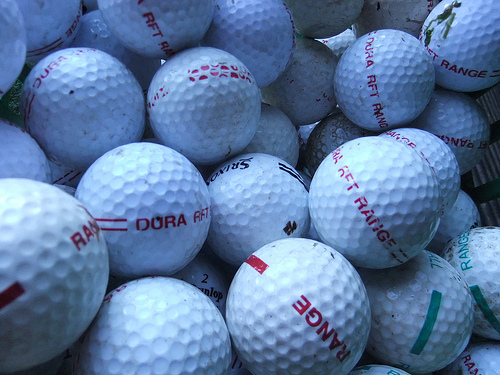 Consider purchasing used or recycled golf balls from driving ranges, garage sales or even online. While these golf balls might be low quality, they are perfect for the person who is trying to learn the game of golf but is unsure how much they like it yet.